Reliaguard Inc., manufacturer of products to improve powerline protection to prevent animal and bird caused outages, has launched its new Reliaguard® product line to complement the GreyEEL Conductor Cover and The EEL Slider. Reliaguard is dedicated to the superior design of animal and bird cover-up for the powerline in order to prevent contacts and resulting power outages. Utilizing injection mold and thermoform processes, cover-up parts as well as conductor cover are manufactured to the highest standards – all intended for use for the prevention of animal and bird-caused power outages on the powerline. Reliaguard® has developed a proprietary material, known as Reliatanium, to manufacture its Reliaguard® parts. Reliaguard® is the right product for utilities looking for a superior fit commodity cover-up product to protect common equipment types such as bushings, switches, lightning arrestors, pin insulators, terminators, and dead ends. Reliaguard® manufactures products for customers requiring volumes of a single cover type or volumes of conductor cover. Protecting conductors is an essential component when applying effective cover-up to prevent animal and bird caused outages. Reliaguard’s GreyEEL Conductor Cover helps prevent contacts by eliminating gaps in coverage. The product’s improved protection is achieved with a significantly overlapped seam design and material memory technology that supports exceptional closure performance. 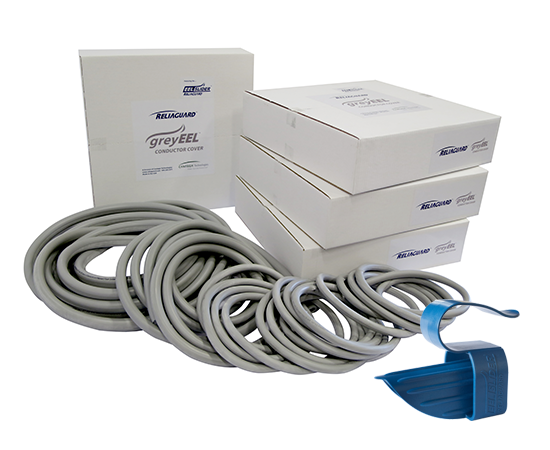 Reliaguard has developed the revolutionary EEL Slider tool to apply GreyEEL. The EEL Slider is a dielectric tool designed for use with the rubber glove work method or for de-energized installation. The difficulty of applying conductor cover by hand is eliminated with the EEL Slider. Ergonomically designed and easy to use, the EEL Slider optimizes safety, dexterity and the speed of applying GreyEEL. The EEL Slider is Patent Pending. For more information on Reliaguard® powerline parts, GreyEEL or The EEL Slider, please contact our direct sales force at 949.305.3311 or sales@reliaguard.com, or visit the Reliaguard website: www.Reliaguard.com.